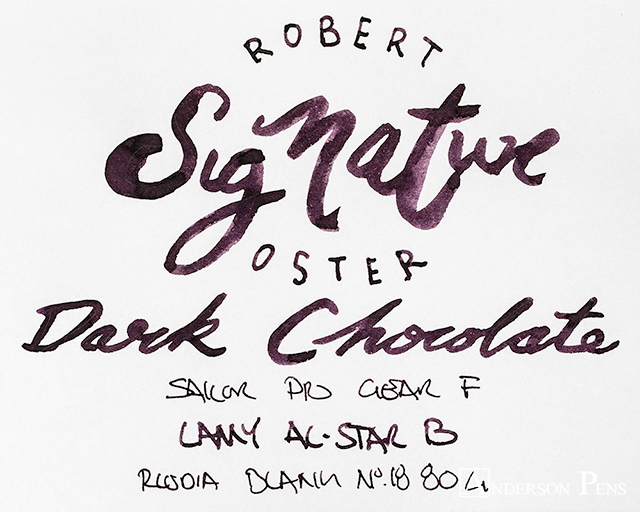 We’re all grown up and enjoying some Dark Chocolate – Robert Oster style. Robert Oster Dark Chocolate is closer in color to the cacao pod than to the processed dark chocolate we all know and love. 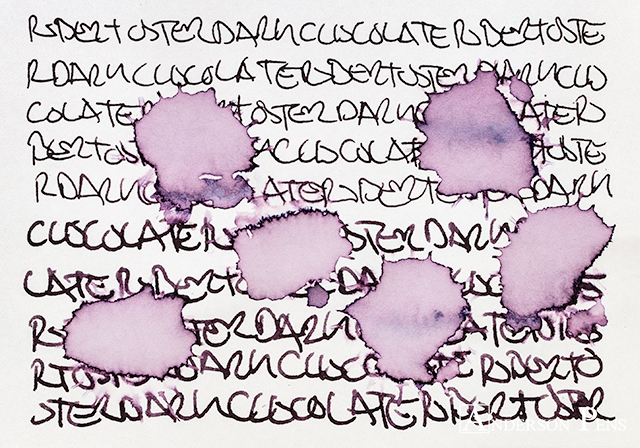 We’ve been big fans of the Oster inks ever since we started carrying them, and Dark Chocolate makes for a great everyday ink. 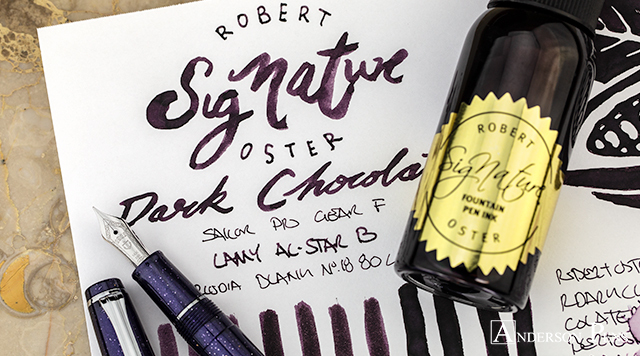 Robert Oster inks come in a 50ml plastic bottle. 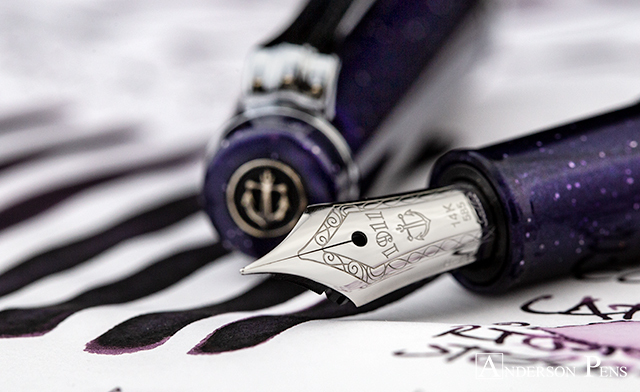 This review was done with a Sailor Pro Gear F, Lamy AL-Star B, and on Rhodia blank No.18 paper. Dark Chocolate isn’t your typical chocolate-colored brown. Instead, it is a rich violet that can appear nearly black at a glance. 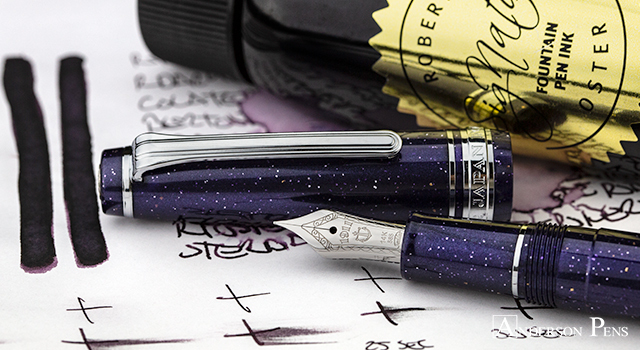 With a fine nib, the ink has a uniform appearance, but a broad nib brings out some decent shading. 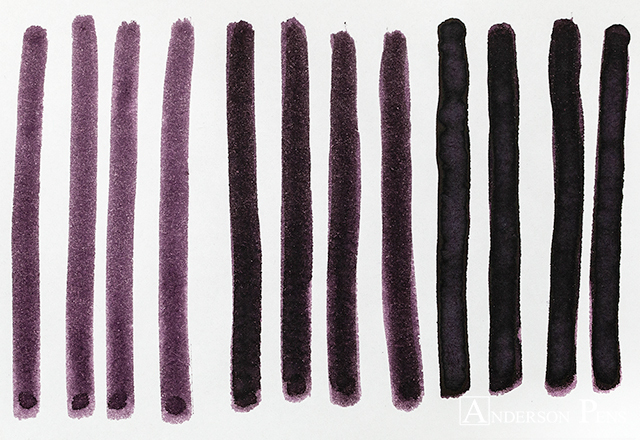 The lightest color the ink gives us is a heather mauve. From there, it shades to a dark eggplant before finishing as a near-black. 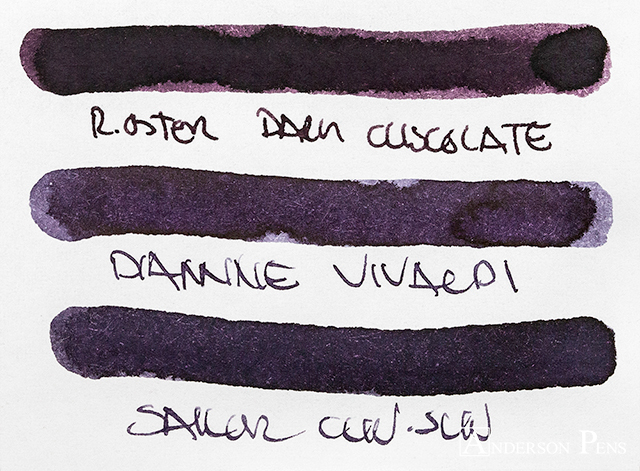 I’ve had nothing but good results with Oster inks, and Dark Chocolate is no exception. The ink has good flow, with no feathering or bleedthrough on Rhodia paper. Dry times are good at 20-30 seconds. The ink doesn’t have any water resistance, but clean up is easy. The ink has a matte appearance that does not produce any sheening. 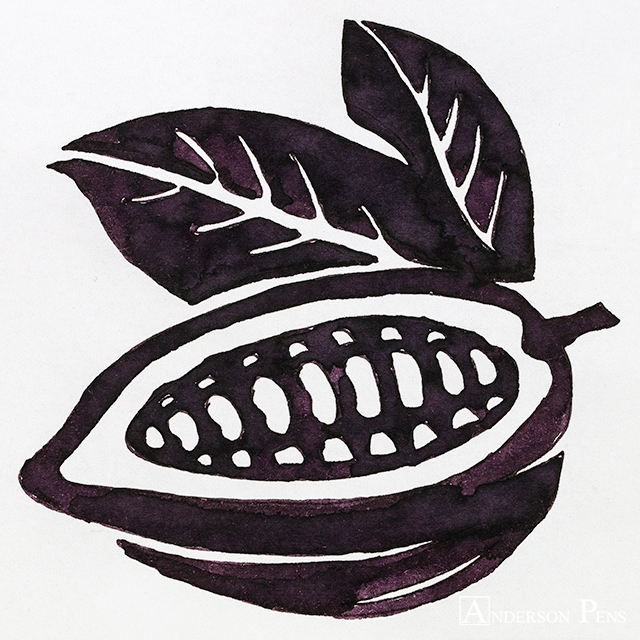 While it isn’t the flashiest of colors, Dark Chocolate is a great daily-use ink. It’s dark enough that it would pass as a work-appropriate ink. 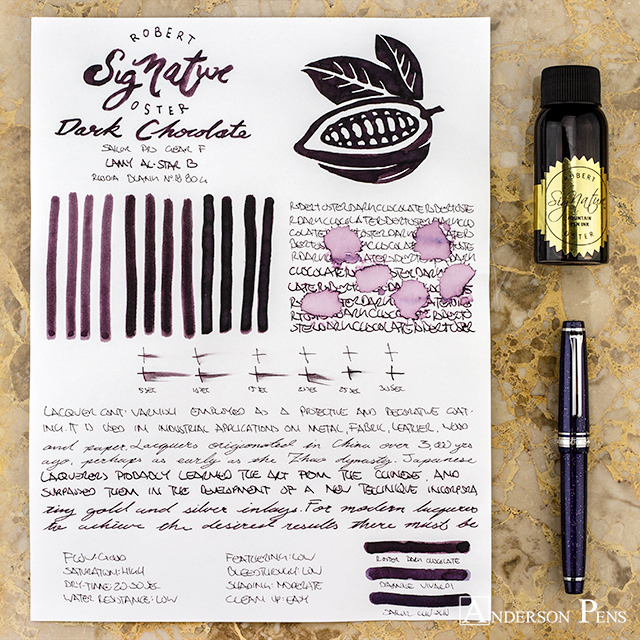 The little hints of violet give Dark Chocolate a nice personality that makes it much more interesting than a normal blue or black ink.